Ed Komp joined ITTC in September 1998. He has more than 15 years experience in designing, implementing, and managing commercial software products. 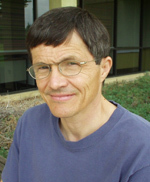 His primary interests include specialized computer language design for application specific domains, functional programming, software development environments, and networking. He received his B.A. in mathematics and his M.S. in computer science from KU in 1976 and 1979, respectively. He was the primary software architect for the Block Oriented System Simulator (BOSS) and helped found a local company to commercialize this tool. He also was the primary software architect and manager for the Block Oriented Network Simulator (BONeS), a second commercial product success. Cadence Design Systems eventually purchased the start-up company that Komp co-founded. He stayed with the company and continued to specialize in graphical simulation tools.